DDA delivers another new website design and receives high accolades once again from a long-term client for the redevelopment of the Smith Services website. In 2013 Timken, the parent company of Philadelphia Gear, a long-term client of DDA, had recently acquired a number of smaller companies. One of these, Smith Services, had a website that was very outdated and in dire need for a redesign. Philadelphia Gear, which took responsibility for this task, asked DDA to redevelop the website and give it a fresh new design with the intuitive navigability and positive overall user experience that Philadelphia Gear knew it could expect from the experts on all things online, DDA. Owing to the fact that the Smith Services website was the most outdated one that Timken inherited with its recently newly acquired businesses, Philadelphia Gear was urgent to get its redesign and redevelopment under way as soon as possible. Using the newly redesigned Smith Services logo as a starting point, DDA set out to create a stylish yet uncluttered design that would reflect the rugged mechanical capabilities and practical and dependable nature of the business itself. Furthermore, DDA would offer its own unique solution for the PowerPoint slide deck with images and captions used on the previous site that would both enhance usability and overall aesthetics. 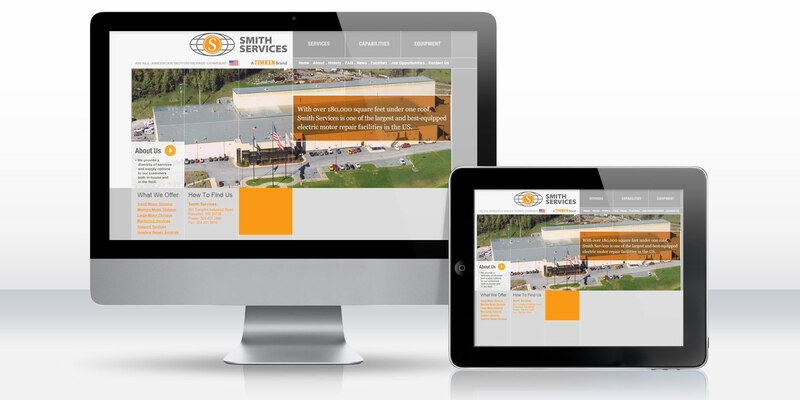 During the design process, DDA made judicious use of the white and tangerine colors that defined the Smith Services logo and used a grid pattern as the essential design motif for the website. DDA selected the best photos amongst the PowerPoint-based photo gallery from the previous site to add visual appeal to the core content pages that would be thematically appropriate. A large overhead shot of the facilities introduces website visitors to the company on the homepage with a caption indicating that the company boasts some of the largest and best-equipped electric motor repair facilities in the United States. The menus placed a heavy emphasis on the three areas that would be most important to the average website visitor by placing these selections up top and with larger link areas than the others: Services, Capabilities, and Equipment. The last of these linked to the PowerPoint slide deck of images and associated captions inherited from the previous website, but this time these materials scroll through automatically with secondary navigational buttons allowing the user to get to the precise information they need. Specific links to the main divisions and services reflected in this PowerPoint slide deck were included on each page for quick reference as well. Other pages included further background on the company, a FAQ section, a News page, and a page to allow new potential customers a way to reach out to the company for more information or find their physical location on a map. The newly redesigned and redeveloped website was a vast improvement from the late-'90s-era website inherited from earlier. Philadelphia Gear responded warmly to the final site with the following: "Last, I'm very happy with the condition of the site, especially compared to what we inherited. More great work by you and the DDA team, as usual. I've been working with David and the DDA team for more than a decade by now and you guys have never let me down!"